The issue of inequality has been pushed to the forefront in recent years. Partly, perhaps, due to Thomas Piketty’s surprise 2013 bestseller, but more definitely due to the growing general awareness of statistics about wealth and stagnating wages. 1. The 2018 Tax Cut. There are so many angles to this. How have different citizens understood the change, and who liked, disliked, or asked for it? Republicans sold it based on small temporary tax reductions for most people, and on the old supply-side argument that a lower tax burden will supercharge growth. The big deficits likely will reduce the government’s options for future redistribution. The net is that the act will probably only exacerbate inequality. Whether it is under the pressure of domestic labor or out of fear of cultural heterogeneity, the rich world has begun a process of walling itself in, creating de facto gated communities at the world level. The most infamous of them is the U.S.-Mexican border fence that is supposed to run for seven hundred miles. It is, at times, a twenty-foot cement wall, reinforced by barbed-wire obstacles and equipped with numerous cameras and sensors. The Mexican Wall should, when fully constructed, be seven times as long as the Berlin Wall and twice as high. Trump has been successful in portraying immigration as a threat, in terms of crime but also in terms of jobs and lower wages. Inequality is a force that energizes his base. What determines inequality among individuals? What economic effects does inequality have (good/bad/other)? The ethical view of different social arrangements. 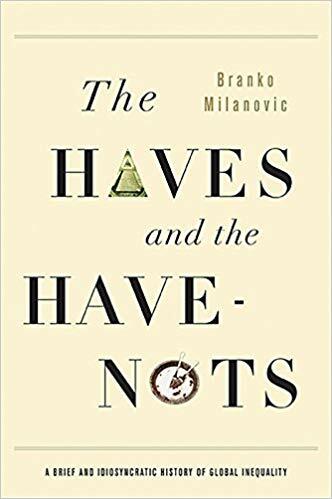 He reviews the evolution of thought on the economic questions: from Marx; to a favorable view of the wealthy as a vehicle for capital investment; and to more recent and more nuanced views. The basic dilemma still remains: limiting inequality while not squashing the profit motive that drives economic growth. In Cold War socialist countries, inequality was fairly low. Milanovic points out, however, that the elites in such countries were always trying to get their hands on western-made products, but never throughout this entire period did socialist countries produce a single product that was competitive or desired in western markets. 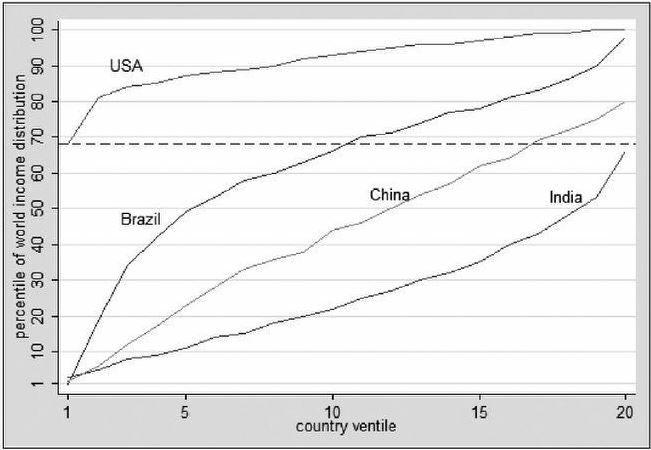 Here we can see that the average income of the richest one-twentieth of Indians is less (even after adjusted for purchasing-power parity) than the average of the poorest one-twentieth of Americans. And maybe it is not. But will that energy ever become focused enough to effect change, particularly when the electoral deck is stacked by wealthy donors whose aim is to obfuscate these issues? Moral outrage may motivate some voters to escalate action; however, there also would need to be more widespread consciousness about the various rationalizations that are advanced to justify and defend super-wealth. Rage against the “one percent” has become a meme. This highly-watched video on Youtube illustrates the perspective. People who pay attention are impressed at how much the 1% own… but, then what? It’s not obvious what specific redistributive policies can be implemented. I do wonder whether the majority of poor and middle-class Americans is terribly energized about the one percent in the way that the politically-engaged classes are (many of whom are relatively affluent). In a recent Atlantic article, Matthew Stewart describes the top 9.9% as a new aristocracy. This group can rail self-righteously about the top one percent, but there’s a bit of hypocrisy. Meanwhile, ironically, many middle-class Americans actually admire our richest and most successful capitalists. If a coherent debate could be had between the middle class and the 9.9%, the disagreement could be about the ideal overall shape of the curve.